What is Religion? What is Deen ? what is the difference between Deen and Religion? if there is a difference between Deen and religion, then is Islam Deen ? or is ilsam religion ? this article will clear some common misconceptions and questions about Islam. next time if anyone asks you about difference between deen and religion, you wouldn’t stay quiet ! Word Religion or “Mahzab” comes from root “zahab” which means to go , pass by or walk. literal meanings of religion are faith, belief and mannerisms. Being a latin word, religion means binding together (from verb religare meaning to bind together). Religion is a bond between a religious devotee and his God. This devotion is all about rituals and faiths. Where as Deen, is a complete system, which in case of Islam means to accept absolute sovereignty of ALLAH. It is about absolute submission of man to absolute sovereign. it encompass reward and accountability, a complete code of life with an applicable social, economical, political and religious system. 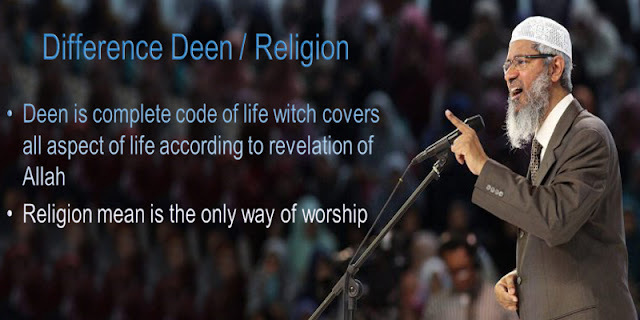 Deen is divine and dynamic as well. it is a collection of institutions, social order, practices and beliefs. Islam, is a Deen, not just a religion. First difference between deen and religion in concept. Frame of reference of both is different. Religion is an individual matter, but deen is a collective matter. Religion is specifically focused on rights of ALLAH. In fact, center of religion is ALLAH and its worship, but center of islam as a Deen is HUMAN being. So, deen has a broader canvas then religion. Deen has been approved of and favored by ALLAH subhana hu wa taala, and is also complete in all dimensions. A question arises here from the claim that Islam is a deen not just religion. Islam has its own unique economic system which in neither capitalistic nor communistic. Unlike modern interest based banking system, Islam promotes “ishteraak”. This thought can put an end to the on and off wars between the two ideologies and frequent economic recession. Similarly, islam also provides complete guidelines on governance and administration. it provides a system of governance which is in mid of monarchy and democracy, eliminating flaws of both systems and adding some of unique islamic concepts. Clear guidelines on public administration. It even teaches about rules of war ! how to treat non combatants, military strategies. Unlike system of west which is based on “Freedom”. Islam gives a social system based on “brother hood“. Just as Ibn-i-khuldoon identifies that Al-Asabiya, the social solidarity is a necessary component for health and evolution of a society, Islam has also emphasized on social solidarity in form of concept of brother hood. Where individual actions can have a collective effect. Since, the epicenter of Deen is human, Islam is such a magnificent deen that it guides about existence of other religions under its dominance. And these guidelines are not hypothetical. In fact, there demonstration was shown by prophet Muhammad (s.a.w) and the rightly guided caliphs in state of Madina. Concept of jizya tells a peaceful co-existence of multiple religions under a greater dominant system Islam as a deen. Sadly today, this magnificent complete code of life for HUMANITY has been shrunken to a religion for muslims only. We unfortunately have disturbed the ingredients of the recipe, miss out majority of them, and then complain about tasteless dessert. Any protocol, when implemented in a partial and restricted form would not bring about optimum results claimed by author of the protocol. So is the protocol faulty ? or the person who performs it is ? In other words, if today muslim nation states ( remember we are divided into nation state now, we no more act as an ummah which was devised by islam) face difficulties and experience terrible internally and externally sponsored violence, Dose the fault lie in the islam ? Has Islam failed ? or we have failed as muslim ?